Presenters outlined the beginnings of an action-plan — using words like love, truth, wisdom, humility and trust — to reach a community that is "over-represented as both victims and offenders." 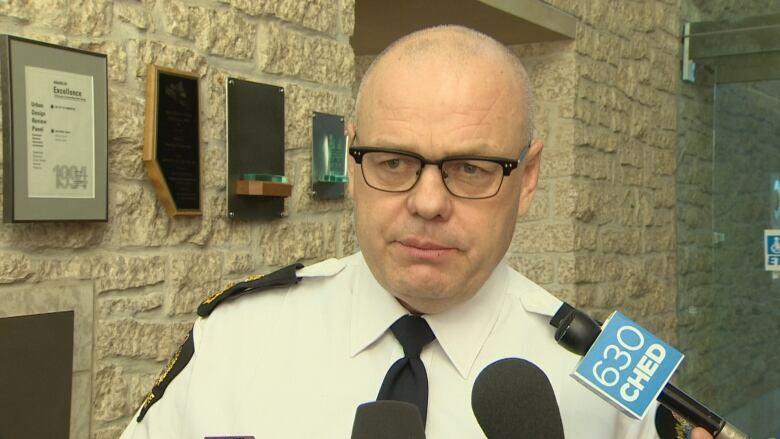 Under McFee's leadership, police would develop a model of engagement informed by Indigenous knowledge, experts "and most importantly the community that we are serving." "We look forward to coming back to you in the future to present an inclusive and impactful community engagement approach that will encompass both the organizations and communities needs and values and to begin changing the narrative from us and them to we. Chi-miigwech," said Levy, thanking the crowd Ojibway. Police chief Dale McFee says the Indigenous relations strategy is a priority for Edmonton police. Under McFee's leadership as police chief for eight years in Prince Albert, the number of Indigenous officers grew to 38 per cent. He employed less conventional recruitment strategies such as asking Indigenous leaders and elders to endorse policing.